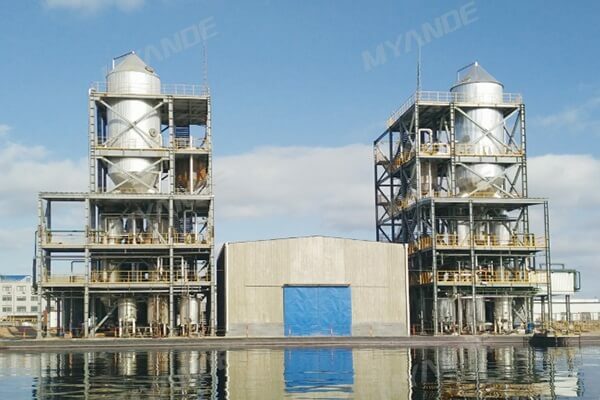 Crystallizer For Sale | Myande Group Co., Ltd. Forced circulation evaporative crystallization system is widely used. The raw material liquid and circulating mother liquor are sent to the heater for heating through circulating pump, and then enter the FC crystallizer. Part of the crystal slurry is discharged from the conical bottom of the crystallizer, and the undischarged mother liquor returns to the crystallization chamber through circulation tube by the circulation pump. The circulation reciprocates to achieve a continuous crystallization process. 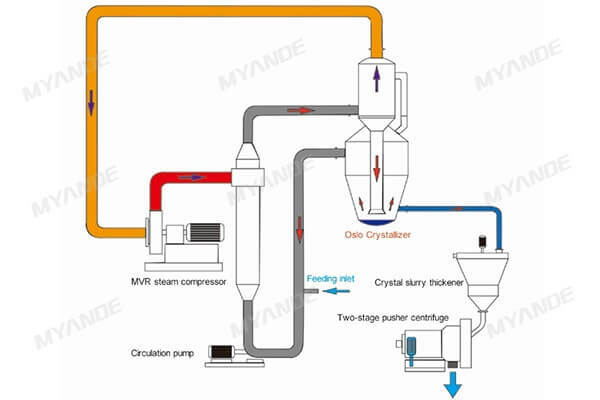 This kind of crystallizer can enhance heat transfer effect, and it is effective for high-density, high-viscosity solutions with large production volume. It is suitable for evaporation and crystallization of high-salt wastewater with a complex composition and low requirements for particle size. - Low requirements for material properties, flexible operation. - Axial type feeding, to improve the crystallization effect. - High flow rate in heat transfer tubes to avoid scaling on the tube wall.